Canadian Foreign Minister Chrystia Freeland. There’s no NAFTA deal yet – despite hints of optimism as the latest deadline bears down. 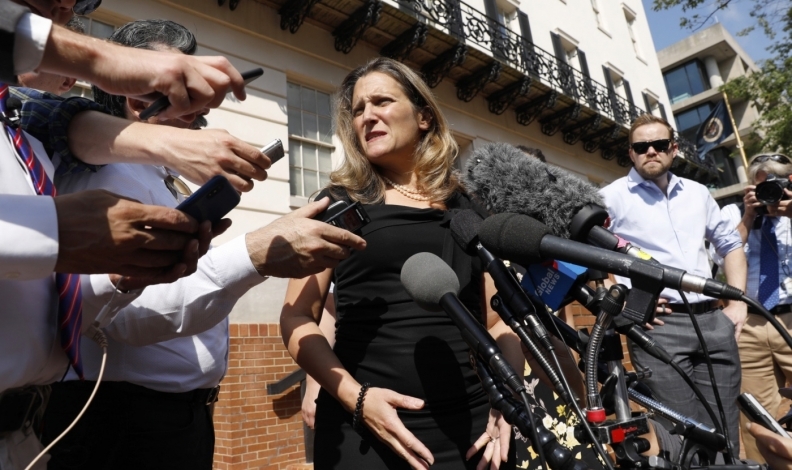 Canadian Foreign Minister Chrystia Freeland and U.S. Trade Representative Robert Lighthizer met twice Wednesday, in two sessions totalling nearly four hours after lower-level staff had worked through the night. Freeland emerged saying those officials’ talks would continue into the evening and she’d meet Lighthizer again Thursday. A deal is likely needed within days to meet a deadline that would allow it to be signed by Mexico’s outgoing president. If the deadline is missed, U.S. President Donald Trump has threatened to proceed with Mexico only, potentially quitting the existing NAFTA pact and slapping auto tariffs on Canada. The talks Wednesday focused largely on tariffs and dispute panels, according to a major stakeholder, Canadian labor leader Jerry Dias. Those subjects are two of the biggest sticking points, but time is running out for a breakthrough. The pressure to secure an agreement quickly is meant to allow time to publish the text of an agreement by Sept. 30. The sides are aiming to do that to meet U.S. trade law timelines and allow the deal to be signed before Dec. 1, when Mexican President-elect Andres Manuel Lopez Obrador takes office. Canada has, however, downplayed the deadline, and several have been missed in talks so far. The U.S. Trade Representative’s office did not respond to a request for comment Wednesday. Canadian Prime Minister Justin Trudeau said he hopes a good deal can be reached. “But we’re going to need to see a certain amount of movement in order to get there, and that’s certainly what we’re hoping for,’’ he told reporters in Ottawa on Wednesday. Any deal will likely see Canada give access to its dairy market, as well as concessions on intellectual property, pharmaceutical patent protection and cross-border shipping. In return, Canada would want the preservation of dispute panels to handle anti-dumping and countervailing duty cases, an exemption on cultural industries, and to avoid auto tariffs. The dumping panels, presently enshrined in Chapter 19, are a core sticking point, Dias said, because the Canadians don’t trust U.S. courts to give them a fair hearing. “Having Colonel Sanders take care of the chickens – in other words, having all disputes handled in U.S. courts – just doesn’t make any sense for Canadians,’’ Dias said. There is, however, impatience among some in U.S. Congress that talks are dragging on. Congress will play a key role in the process, and senior figures have warned that Trump can’t advance a deal under his current legal path if it doesn’t include Canada, whereas Trump argues he can.